The Adoremus Congress Day on Saturday 8th September was an inspirational event. The ACC Liverpool Echo arena was packed to the rafters with pilgrims, including 150 from our own archdiocese of Cardiff. Unfortunately road works had held us up and we just arrived in time to hear the keynote address by Bishop Robert Barron, although because of our late arrival we were all split up and spread out in various parts of the arena. I managed to sneak into the front row right by the stage and was surrounded by delegates from the diocese of Nottingham, including priests, who were wearing Robin Hood hats. The Lincoln green headgear were an expression of joy, a joy which filled the arena with hope that our Catholic faith was here to stay, was here to prosper, was here to spread to the wider world. Banners had been banned but the Nottingham contingents got around this by wearing their Robin Hood hats. The key speaker at Adoremus on the Saturday was Bishop Barron, who made the point that when we came together in musical praise to God “We expanded our faith, no matter how bad our singing voices were,” he added. It was a point I deeply appreciated as a former chorister myself, although I mentally excluded myself from any disharmony! The bishop revealed his own experience of seeing Christ at the centre of life when he first visited Paris and entered Notre Dame Cathedral. “In the North Transept I stood before the magnificent rose window for half an hour, marvelling at the expression of faith,” he said. “It brought home to me that life had to be centred on Christ.” He quoted C.S. Lewis’ remark that if a convoy of ships sailing in the ocean had one ship sailing in a different tack, then harmony was lost, as it would be in our lives. “Find the centre and your life will be in harmony,” Bishop Barron told the assembly. And being in Liverpool he mentioned the Beatles and looked at John Lennon in terms of faith and belief with his lyrics in a negative song “Imagine there’s no Heaven” early in his career. But Bishop Barron said that later in his life, and near to his death, he became more interested in listening to preachers and watching them on TV. “Just before his death he wrote a song ‘Watching the wheels go round and round. I am no longer on the merry-go-round.’” Did he find faith then at the end of his life, Bishop Barron asked? “Did he come off the wheel of fortune? He had tremendous power, lots of money. He travelled all over the world and was famous. “What was it like to be on top of the wheel of fortune. Let me give you a clue…’Help, I need somebody’ …a line from one of his famous lyrics.” Of course, in Liverpool, he had to mention the Beatles. But the mention came from one who admired their music and who, he told us, had a poster of the Beatles stuck up on the walls of one of his rooms. Yet this was not playing to a Liverpool audience. The thousands of pilgrims came from all over England and Wales…some may have preferred the Rolling Stones! What came from Bishop Barron was a revelation of how we find faith, how we find Christ, how we make Christ the centre of our lives. ‘Help, I need somebody,’ as John Lennon wrote. 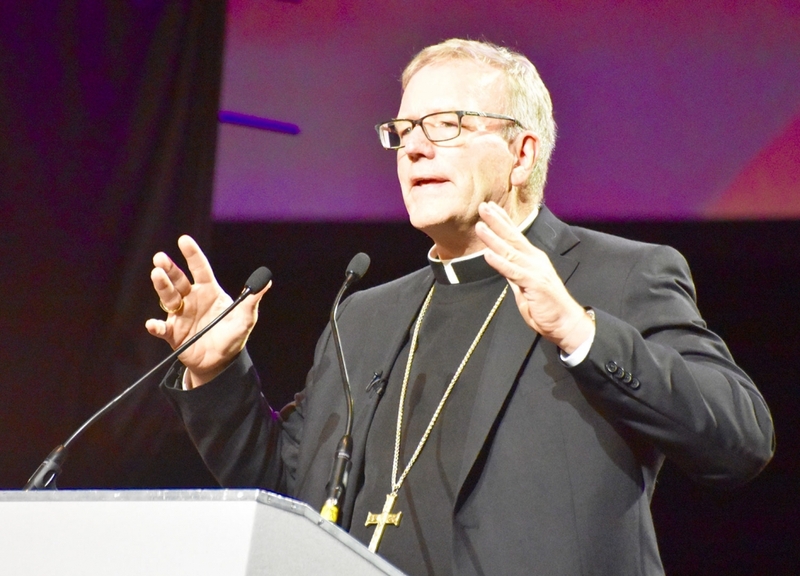 Bishop Barron’s inspiring, and moving keynote address was received with tremendous applause from the pilgrims that almost lifted the roof off the arena. The applause was indeed a tribute to the initiative of the Catholic Bishops’ Conference of England and Wales in creating Adoremus 2018 and giving us the opportunity to come together in faith. Our three busloads from Wales returned down the M6 and M5 with some very happy pilgrims who had been given a day of presentations of faith, from young and not-so-young, which underlined the theme of Adoremus as a unique opportunity to gather and reflect on the centrality of the Eucharist and, particularly, to explore the place of Eucharistic Adoration. · Robert Emmet Barron is an American prelate of the Catholic Church, author, theologian and evangelist, known for his Word on Fire ministry. He has served as an auxiliary bishop of the Archdiocese of Los Angeles since 8 September 2015. Previously, he served as Rector of Mundelein Seminary in the Roman Catholic Archdiocese of Chicago. Diocese set to welcome further refugees as Newport parish opens wide the do... Biggest Catholic Youth Festival! !